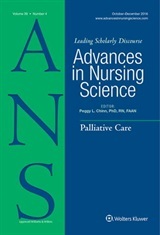 Thoughts on: “Bringing Values Back Into Evidence-Based Nursing: The Role of Patients in Resisting Empiricism” by Porter, O’Halloran, and Morrow. What a great article. Nails a number of things that I have been tangentially interested in. Without in any way suggesting a deficit it was interesting to me that little attention seemed to be given to “how” and “why” we got here: How and why we have slipped up and where we must go to get out of the hole so many of us feel we are in.